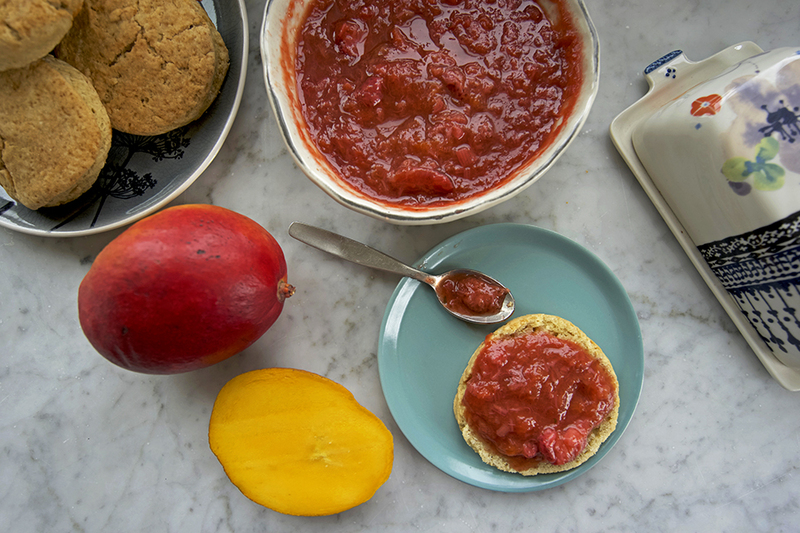 Rhubarb meets mangoes in this perceivingly exotic and versatile compote! In the old days, the processes of canning and jarring were essential to preserving the harvest well past winter. 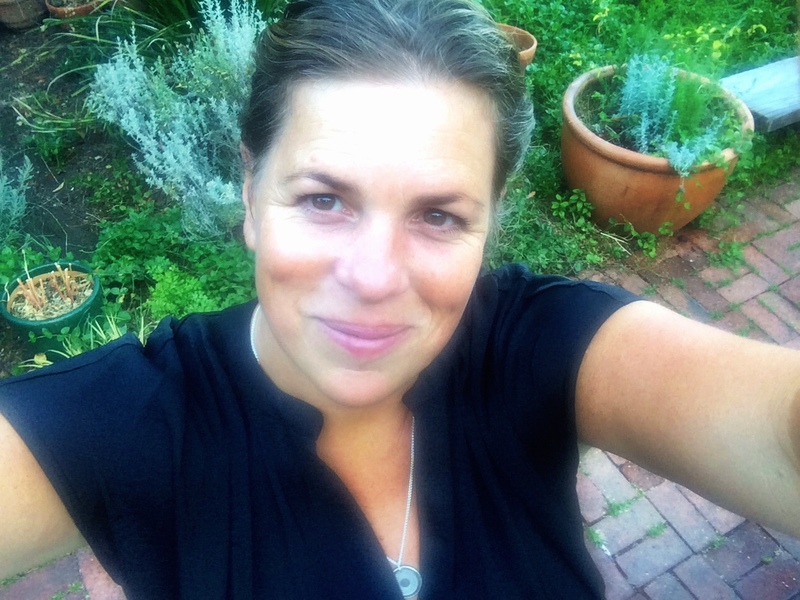 Today, as the world has access to most ingredients most of the time, preserving has become less essential and more of an exciting culinary trick. Making jams and compotes is one of the best ways to extend the life of your favorite seasonal fruit past the curfew nature has set for it. The creativity inspired by the blank canvas of making your own appeals to me most. 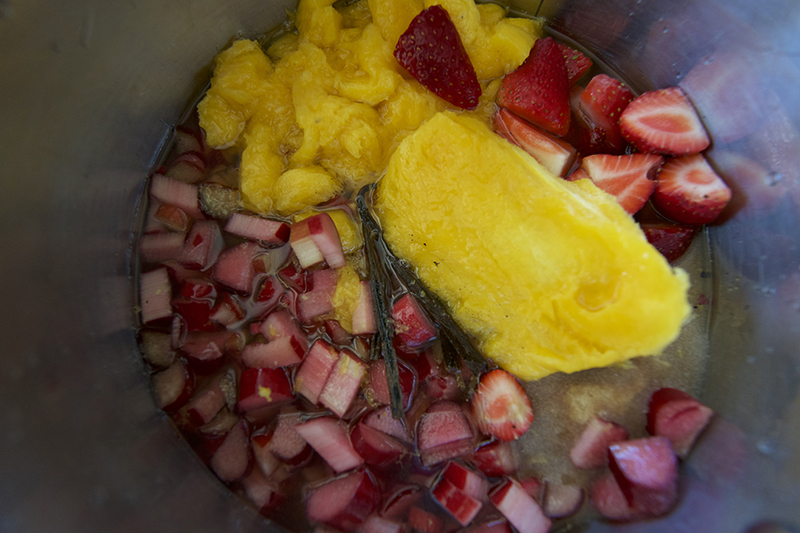 I can add herbs, spices, booze… I can go sweet, tart, spicy, tropical… (See: Mango Jam). 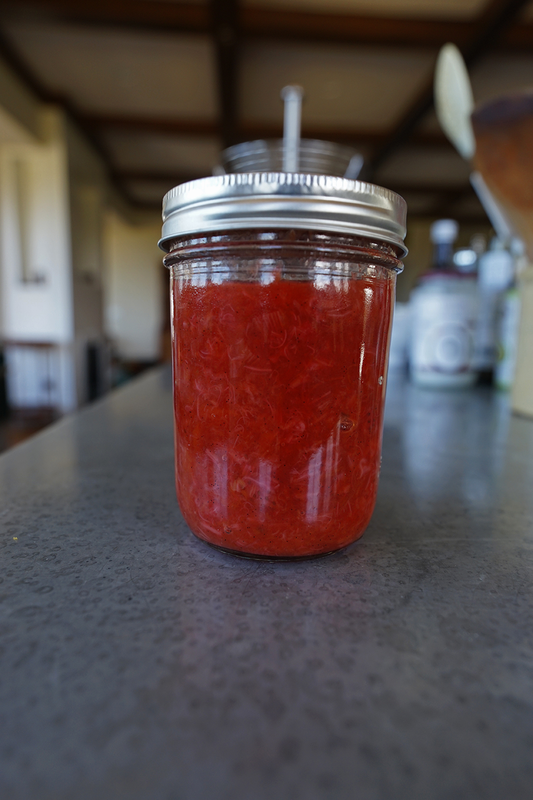 There is some relief in knowing that you don’t have to have preserving and canning in mind to make jams and compotes. They can last several weeks in your refrigerator, and you can use them a myriad of ways. What’s the difference between a jam and a compote anyhow? Jam is mostly whole fruit, chopped and cooked down in its own natural juices, with or without a small amount of sugar. Compotes are chopped, or even dried fruits, cooked down in a sweet syrup of water and sweeteners or other liquids. 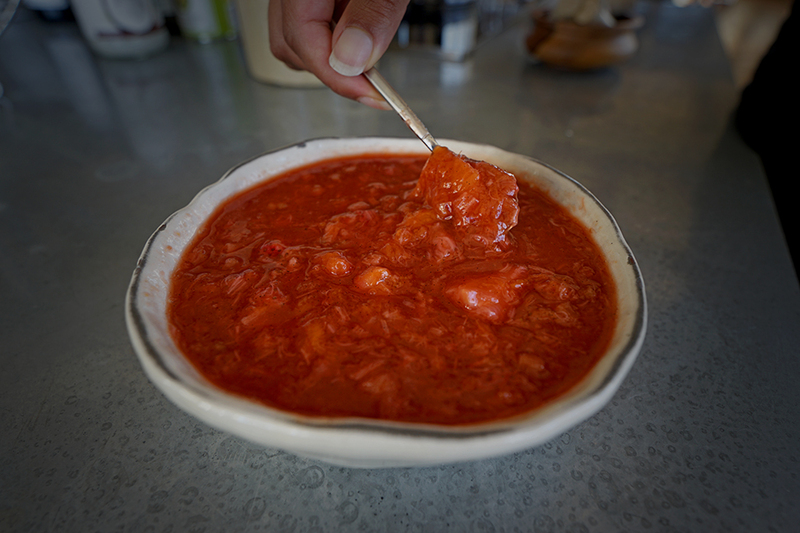 Jams are typically more thick where compotes tend to have a loose consistency. Compotes tend to be sweeter than jams, but not always. No matter where you are, spring is about the only time of year you will see rhubarb in your local farmers markets or stores. 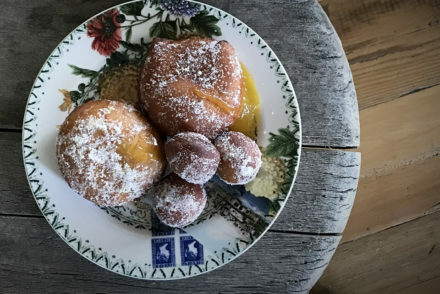 It’s one of the few items that can’t be found year-round and is still quite a delicacy in the short spring window it is available. 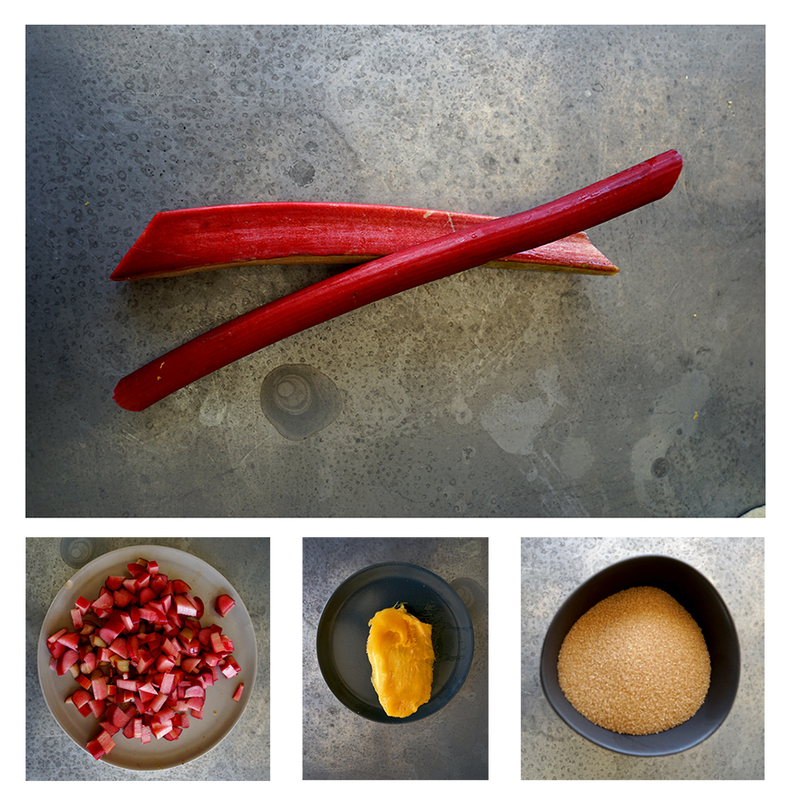 Rhubarb’s tart composition fuses well in a compote. Cooking it down in a sweet, syrupy liquid allows its beautiful rose undertones to rise to the surface. Strawberries, with the best available at the same time of year as rhubarb, make a charming companion, but the addition of fresh mangoes add a more complex dimension to the line-up, a deep perfumed bouquet of fruits. By playing off the mango’s natural sweetness, I can get away with using less sweetener. 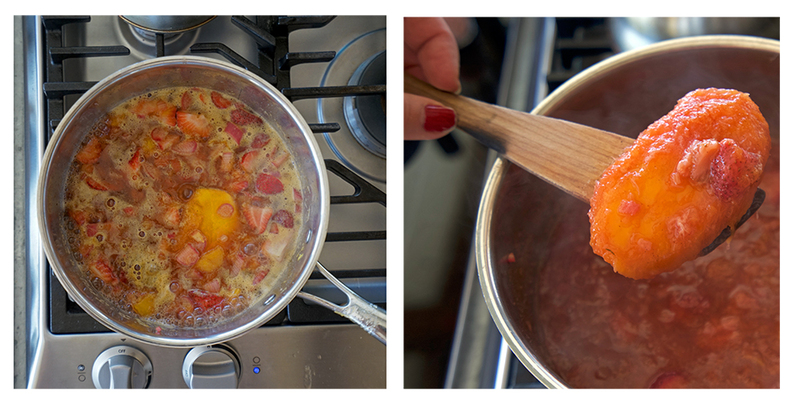 I can’t explain why Rhubarb-Strawberry-Mango Compote reminds me of the sweet scents and flavors of the Middle East. 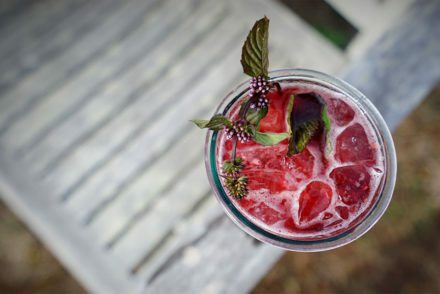 It could be the rose essence that comes out of the rhubarb as it blends with the mango’s deep perfumed syrup. Combine all ingredients in a medium sauce pan, and bring to a boil. Reduce heat to low, and allow to boil gently for about 15 -20 minutes, stirring every few minutes. The compote will begin to thicken, and the fruit will begin to break down into the syrup. Continue to stir until desired consistency and thickness. After 20 minutes, thickening happens very quickly, so watch the mixture closely. Remove from the burner, and allow to cool completely. Remove and discard the mango pit(s) and the vanilla bean. Refrigerate for up to 3 weeks. Options: Adding little ground cardamom, crushed rose petals, and more water to make the syrup (compote) even looser, creates and exotic spring baklava syrup. Tip: If you want to make this into a coulis, blend it. That’s the secret to making a coulis is blending a compote! Uses: The compote works in an array of recipes and kitchen ideas. Spread on grainy toast or bread. Brush it over grilled meats or fish. 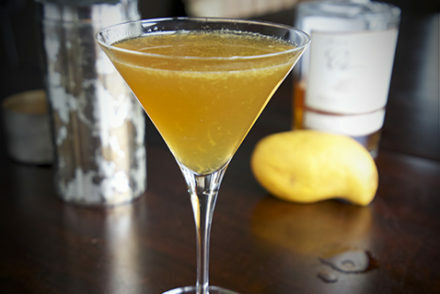 Shake it up in your favorite cocktail, or add it to your favorite vinaigrette recipe. The possibilities are endless. *Monk Fruit Sweetener is a sugar substitute said to be 100-250 times sweeter than white sugar, although I don’t think it tastes much sweeter than regular sugar. I have been able to use it 1:1 and not felt like it’s made anything too sweet. It has zero calories, zero carbohydrates, and zero negative effects on blood sugar. Its “sugar crystals” act exactly like regular sugar in baking. Taste-wise, I think it is better than any “sugars” on the market.